2006 NPC Southern States Bodybuilding, Fitness & Figure Championships! 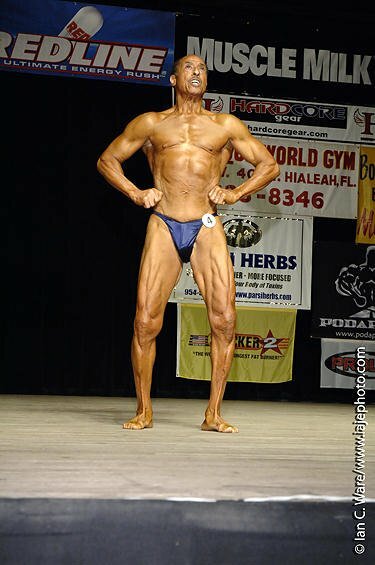 The NPC Southern States Championships was held at the War Memorial Auditorium in Ft. Lauderdale on July 14-15th, 2006. Get the latest commentary, results, and pics right here! The NPC Southern States Championships has grown so much over the years that starting back in 1996 it had to expand into a two day event in order to accommodate the burgeoning women&apos;s fitness and now figure events. Held in the War Memorial Auditorium in Ft. Lauderdale, the 2006 NPC Maria Bellando Fitness & Figure and Manuel Mair Men&apos;s Fitness Southern States took place on Friday evening, July 14th, followed by a full day of bodybuilding on Saturday, July 15th. One of the largest regional national qualifier competitions east of the Mississippi, the contest attracted just under 200 athletes from 15 different states. A testament to the caliber of competitors each year is the fact that 15 of the overall winners are now IFBB Pros. Dexter Jackson, who won the title in 1994, leads the pack in titles and recognition. Featured guest posers included IFBB Pros Gustavo Badell, Darrem Charles, Gunter Schlierkamp, Bill Wilmore and Tracey Greenwood. They were joined by last year&apos;s overall winners Debi Laszewski and Darin Page. In the Teen Fitness (divided into 2 age groups 13-16 and 17-19), UCF student Megan Davies took top honors. 13 year old Rachel Gardner was the hit of the evening with her electric posing routine earning her a standing ovation and two special awards, Best Routine and Spirit of Fitness. In the Open Fitness, 25 year old Ozzie Jacobs of Tampa, FL was the overall winner. Five times Florida Ultimate Athlete and two times winner of the Southern States Men&apos;s Fitness, Manuel Mair took over co-promoting the Men&apos;s Fitness in 2002. This year&apos;s event saw the largest turnout ever. With the exception of Brad Craig in his NPC Emerald Cup in Washington, few NPC promoters include a men&apos;s fitness. It was a perfect blend in this case for the all women fitness & figure competition on Friday night. This event is no beauty contest as two of the rounds are comprised of the max push-ups and chin ups for 1 minute and a rigorous obstacle course. Winning the title was 44 year old Monte Masterson of Panama City, FL. The sport of Women&apos;s Figure has grown beyond the expectations of most promoters. Such was the demand that age groups had to be added. In the Figure Over 50, Dr. Maureen O&apos;Connell from Western Springs, IL won her class and the overall. 41 year old Coral Gables, FL hair salon owner Marisel Rodriguez dominated the Over 40 category. Winning the Over 30 Figure was commercial real estate agent Cassandra Griffith of Hobe Sound, FL. The newly inaugurated Masters Figure Overall went to Cassandra as well. 19 year old Hollywood, FL student Kelly Rodrigues convincingly took first in her age group and overall in the Teen Figure. 29 year old Amy Thompson from Valrico, FL bounced back from a 4th place in the recent NPC Tampa Bay Classic to win first in Class B and take the overall Open Figure title. Kelly Rodrigues & Amy Thompson. On Saturday, the bodybuilding kicked off with the Grand Masters (Men Over 70). 73 year old William Alston from Beverly Hills returned to successfully retain his title. 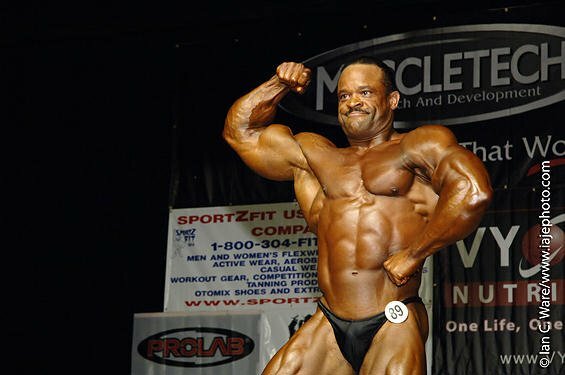 Back in 1994, Richard Swedish of Ft. Myers, FL won the NPC Southern States over 40. This year he turned 60 and added the Over 60 title to his credit as well. Also from Ft. Myers was the winner of the Men Over 50, Paul Hamilton. In the Women Over 50, the phenomenal Suki Patterson of Patrick Air Force Base went home with the title. William Alston, Paul Hamilton & Suki Patterson. After a 10 year absence from competition, Miami-Dade Sheriff Andre Vaughn returned to compete in the Men&apos;s Over 40. Not only did Andre win his class and the Over 40 title but returned later in the evening to win the Masters Overall trophy as well. Karate teacher Grimaldy Sanchez of Miami placed 1st in the lightweight and 1st overall in the Women Over 40. She followed her victory up with another win of the Masters Women Overall title. Carlos Perez-Marcano of Rio Grande, Puerto Rico, won the Men&apos;s Over 35 award. Andre Vaughn, Grimaldy Sanchez & Carlos Perez-Marcano. Runner-up last year, 19 year old James Seymour of Miami came back with even more size but still super shape to dominate and win the Teen overall title. 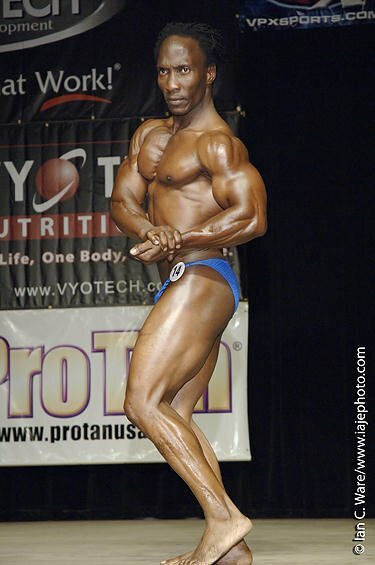 One week after this event, James traveled to Pittsburgh, PA for the 2006 NPC Teen Nationals and won that overall title as well. The David Bailey Memorial "Most Promising Teen" Award went to David Espana. 36 year old registered nurse, Nekole Hamrick of Orlando, FL, was the highly popular winner of the Women&apos;s Open title. Nekole has the ideal combination of muscle, symmetry, balance and femininity and is certain to do well in future national events. A former Teen National winner, 21 year old Jason Huh of Sarasota, FL beat back a strong challenge in the Heavyweight Class from Ryan Stamm to win 1st in his class and then dominate the pose down against six other national caliber class winners including Alphonso Jones (Bantamweight), Joshua Olmeda (Lightweight), John Fettes (Welterweight), Jarred Cannon (Middleweight), Dario Ferrer (Light Heavyweight) and Jose Perez (Super Heavyweight). Jason has the size, shape and razor sharp definition to become a major player at the national level very soon - watch for him! The special award known as the Gene Massey Memorial Award was presented to Manuel Mair. View Pictures From The Show Here. Grand Masters (Men Over 70 Overall): William Alston. Men Over 60 Overall: Richard Swedish. Men Over 50 Overall: Paul Hamilton. Women Over 50 Overall: Suki Patterson. Men Over 40 Overall: Andre Vaughn. Women Over 40 Overall: Grimaldy Sanchez. Men Over 35 Overall: Carlos Perez Marcano. Masters Men Overall: Andre Vaughn. Masters Women Overall: Grimaldy Sanchez. Teen Men Overall: James Seymour. David Bailey Memorial "Most Promising Teen" Award: David Espana. Men&apos;s Open Overall: Jason Huh. Gene Massey Memorial Award: Manuel Mair. Teen Fitness Overall: Megan Davies. Women&apos;s Open Fitness Overall: Ozzie Jacobs. Spirit Of Fitness: Rachel Gardner. Women Over 50 Overall: Dr. Maureen O&apos;connell. Masters Figure Overall: Cassandra Griffin. Teen Figure Overall: Kelly Rodrigues. Women&apos;s Open Figure Overall: Amy Thompson. Spirit Of Fitness: Ken Symanski. Best In Strength: Charles Rose.